Have teachers’ classroom practices changed in the 10 years since the Classroom Practices Study was conducted by The National Research Center on the Gifted and Talented (NRC/GT) (Archambault et al., 1993)? We replicated the Classroom Practices Survey Study in two states in Spring 2002 to address this question. An overview of the rationale, procedures, results, and conclusions of the replication study are described in this article. Many readers of the NRC/GT Newsletter are familiar with the Classroom Practices Survey Study. The original survey was administered to over 7,000 third and fourth grade teachers throughout the country to determine the extent to which high ability/gifted students receive curriculum and instruction that is different from what their average performing peers receive in regular classroom settings. A major finding from the study was that third and fourth grade teachers make only minor modifications in the regular curriculum to meet the needs of their high ability/gifted students. This result was the same regardless of the geographic region of the teachers or the type of communities in which they taught. In the years since this study was conducted, people have inquired periodically about the degree to which the findings describe teachers’ classroom practices today. In addition, differentiation has become a more widely used term, and many districts focus their professional development experiences around this topic. Hence, it was an appropriate time to replicate the survey study. After the publication of the Classroom Practices Survey Study, a few researchers investigated differentiation practices in general education classrooms using the original or modified questionnaire at the elementary and middle school level. For example, Whitton (1997) replicated the study with 606 third and fourth grade teachers in New South Wales, Australia and found that the results were nearly identical to the findings from the original study in the United States. Robinson (1998) adapted the instrument for a Middle School Survey of Classroom Practices, which was administered to 1,008 seventh grade teachers across the United States. His results indicated no meaningful differences in curriculum for high achieving and average students in heterogeneous and homogeneous classrooms in the major content areas. NRC/GT researchers have conducted intervention studies designed to help classroom teachers make more appropriate modifications for advanced learners. For example, Tomlinson et al. (1995) conducted a 3-year project to describe how preservice teachers in three states developed an awareness of the needs of academically diverse learners to implement or modify instruction for meeting those needs. Despite increased awareness of the varied readiness levels and needs of academically diverse students, novice teachers had difficulty making appropriate accommodations for this student population. In another NRC/GT study, an investigation on curriculum compacting, teachers who received professional development on the curriculum compacting process were able to implement the procedure with their most capable students (Reis & Westberg, 1994). In the last issue of the NRC/GT Newsletter, Gubbins (2003) discusses how the classroom practices instrument could be used for a self-study of teachers’ practices. Thus, the original instrument has been modified by some researchers and is used today for a variety of purposes. Use pretests to determine if students have mastered the materials covered in a particular unit or content area. Make time available for students to pursue self-selected interests. Provide a different curricular experience by using a more advanced curriculum unit on a teacher-selected topic. 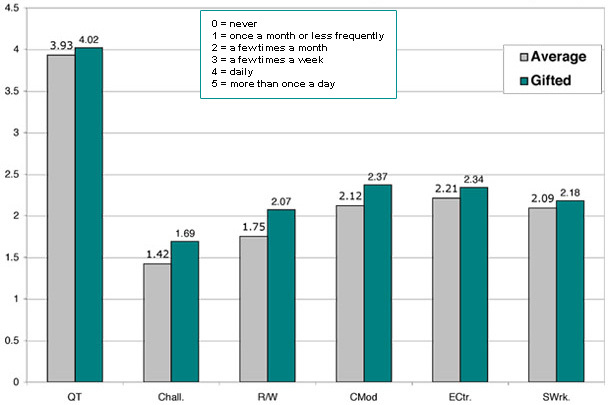 Teachers were asked to respond to the items using a 5-point scale, ranging from 0 = never to 5 = more than once a day, indicating the frequency to which they use classroom practices with both average performing and high ability students. Factor analyses in the original study indicated that the 39 items comprise 6 factors—Questioning and Thinking (QT), Providing Challenges and Choices (Chall. ), Reading and Writing Assignments (R/W), Curricular Modifications (CMod), Enrichment Centers (ECtr. ), and Seatwork (SWrk.). The alpha reliability of the 39 items for the replication sample was r = .94 and r = .90 for average and gifted items, respectively. Due to the expense associated with survey research done on a large scale, we conducted the survey in just two states. We selected two states that differ in two aspects: one state has a gifted and talented (g/t) mandate and is located in the Southeast, and the other state does not have a mandate and is located in the Midwest. We purchased a stratified random sample list of teachers from Market Data Retrieval, Inc., a nationally recognized leader in school survey and market research. The sample was stratified by community type (rural, suburban, and urban) and grade level (third grade, fourth grade.) This resulted in a sample of 1,366 teachers, which is 17% of the third and fourth grade teachers in the two selected states. To maximize the response rate, we mailed a pre-notification letter to teachers informing them the survey was forthcoming. Two weeks later, we sent the actual questionnaire with an incentive (a bookmark) and a postage paid return envelope. A follow-up mailing with the same materials was sent two weeks later. Using these procedures, we received 543 completed questionnaires, a 39.8% response rate. The sampling error estimate (Pena & Henderson, 1986) of the third and fourth grade teachers is calculated to be 2.94% at the 95% confidence level. This means that the practices reported by the sample are considered to be a highly accurate reflection of the practices of all third and fourth grade teachers in the two states. Teachers responded to demographic questions about themselves and their training experiences in gifted education. The majority of the teachers who returned the questionnaires were White (88%) and female (93.9%). The respondents had an average of 17.6 years teaching experience. Many of the teachers had advanced degrees. Teachers’ highest degrees earned were: BA/BS (50.8%), MA/MS (45.9%), Ed.S. and Ph.D./Ed.D. (3.1%). The teachers who responded taught in rural (46.6%), suburban (33.5%), and urban (19.9%) districts. These percentages were representative of the proportions drawn by Market Data Retrieval for the sample of rural, suburban, and urban teachers in the two states. Teachers’ responses to the items about the degree to which they use various practices with average performing and high ability/gifted students were compared. The means of the 6 factors representing their practices with average and high ability/gifted are depicted in Figure 1. Figure 1. Factor means of classroom practices with average and gifted students (N = 543). As shown in Figure 1, the differences in the means between the practices with average and high ability students on the six factors are very minor. In fact, inferential analyses revealed no meaningful differences on any of the factors. When examining the means for rural, suburban, and urban teachers separately, we still found no significant differences (i.e., the means of the factors for average and gifted ratings were nearly identical on all three sub-samples). Regardless of the type of community in which teachers work, their self-reported practices are nearly the same with average and high ability students. Several additional analyses were conducted to examine variables that may be associated with teachers’ classroom practices. In general, we did not find a significant association between teachers’ training experiences in gifted and talented education and their classroom practices. However, when comparing teachers who had taken gifted education coursework at a college or university (n = 179) versus teachers who had not taken gifted education coursework (n = 337), significant differences were found on one factor-curriculum modifications with gifted students (p < .05 with a Bonferroni adjustment). Teachers who had taken gifted education coursework provided curriculum modifications for their high ability/gifted students more frequently. Furthermore, when examining the factor scores of teachers who have formal degrees in gifted education (n = 9) versus those who did not (n = 527), we found significantly higher means on three factors: challenges and choices with average students, challenges and choices with high ability/gifted students, and curriculum modifications with high ability/gifted students (p < .05 with a Bonferroni adjustment), which indicates that they provide accommodations more frequently in these areas. As in the study conducted 10 years ago, we found no significant association between teachers' years of teaching experience and classroom practices with average and high ability students. Complete details about all quantitative analyses from the data collected will be included in a forthcoming journal article. Twenty-eight teachers did not provide any responses to indicate the frequency with which various practices were used with gifted students, i.e., they left this column blank on the survey. Therefore, a third category was labeled “Responses in the Average column only.” One example reflects this category: “Students have not yet been identified as gifted in third grade. The G/T teacher comes in the classroom once a month and does an activity with the whole class” (Teacher No. 523). These teachers’ comments suggest that they believe the gifted education program alone, if one exists in their school, meets high ability/gifted students’ needs. The major conclusion drawn from the replication study is that teachers’ differentiation practices in third and fourth grade classrooms have not changed in the last 10 years. In fact, when overlaying Figure 1 from this article on a similar figure from 10 years ago, the two graphs are virtually identical. Teachers in the two states selected for this replication have more professional development experiences in gifted education than the teachers across the country reported 10 years ago, but this does not appear to be reflected in their classroom practices as reported on this survey. Most of the questions, issues, and implications from these results are similar to those we reported for the national survey several years ago, but some new questions and issues are of concern today. For example, what is the impact of the standards from the various disciplines and state standards on teachers’ classroom practices? Furthermore, how is statewide testing related to this issue? In an extensive quantitative and qualitative study conducted recently by the University of Virginia site of the NRC/GT, the impact of state testing initiatives on elementary classroom practices was investigated (Moon, Brighton, & Callahan, 2003). The researchers concluded: “Teachers reported similar instructional practices regardless of students’ academic abilities,” and “Regardless of the class ability level, teachers reported spending substantial time in preparation for state-mandated tests” (p. 52). They found that high stakes testing appears to have a negative impact on the classroom practices provided to capable students. Some of the teachers’ comments on the survey indicated they, too, are experiencing strong pressure to raise students’ test scores, which may explain why many do not make accommodations for capable students in classrooms. They may be concerned that if they eliminate previously mastered curriculum material for some students, their group achievement test scores will decrease. If this is a concern, the results of the NRC/GT Curriculum Compacting Study should be shared with these teachers (Reis et al., 1993). The findings from that study indicated no decrease in high ability students’ achievement test scores when 40 to 50% of the curriculum was eliminated in at least one subject area. The implications from the survey results for policy makers, educational leaders, and practitioners, which were articulated a decade ago, still apply today. Many teachers continue to believe that their gifted program, even if students receive direct services for only 1 hour per week, meets the needs of their high ability/gifted students. This suggests that continued, increased, or different professional development experiences are needed. Districts should be reminded that they probably have many new teachers who were not on staff when they had original training on various topics in gifted education. In addition, if the new understandings about strategies for meeting capable students’ needs are to be implemented, teachers need more support and encouragement to apply the training. Many districts do not encourage or provide follow-up experiences for teachers after they have attended a gifted education workshop. Stephanie Hirsh, Deputy Executive Director of the National Staff Development Council, makes a forceful argument for doing this by stating: “Training without follow up is malpractice” (1997, p. 1). To address this concern, professional development experts advocate “job embedded” professional development through the use of cadre groups (sometimes called “critical friends” groups), collaborative action research projects, and peer coaching in schools (Bambino, 2002; McAdamis, 2001). The results from this survey indicate that teachers with formal training in gifted education provide curriculum modifications for high ability/gifted students more frequently. This may be due to the fact that they apply the strategies in their classrooms when completing requirements for gifted education coursework. When attending a brief district inservice on a topic in gifted education, teachers are not held accountable for implementing a strategy or practice. And another said, “I need help differentiating. More planning time would help with being able to gather materials and think creatively how to best meet the varying needs in my classroom” (Teacher No. 1204). These quotes illustrate that some teachers want assistance to make instructional and curricular modifications for high ability students in their classrooms. We must remind readers that this study was limited to third and fourth grade teachers’ self-reported practices in two states. Generalizations to teachers in other states or at other grade levels are unwarranted. In addition, we want to emphasize that this was a survey about practices with high ability/gifted students in regular classroom settings and was not an investigation about practices in special settings, such as in resource rooms or full-time placements. Also, we want to make it clear that we are not advocating accommodations for high ability/gifted students in the regular classroom only; rather, we believe that a continuum of special services for high ability students should be provided in school districts (Hertzog, 1998; Renzulli & Reis, 1997). We urge parents, educators, and policy makers to view this study as an opportunity to create effective professional development experiences for teachers and to provide more resources to increase the services for high ability/gifted students. The current economic situation in our nation, the uncertainties about the impact of the No Child Left Behind Act (NCLB), and the results of this research suggest that we have some great challenges ahead of us if we want schools to provide appropriate services for high ability children in regular classroom settings. Bambino, D. (2002). Critical friends. Educational Leadership, 59(6), 25-27. Brown, S. W., Archambault, F. X. Jr., Zhang, W., & Westberg, K. L. (1994). The impact of gifted students on the classroom practices of teachers. Paper presented at the Annual Conference of the American Educational Research Association, New Orleans, LA. Gubbins, E. J. (2003, Spring). NRC/GT looks at self-reflection of classroom practices. The National Research Center on the Gifted and Talented Newsletter, pp. 1-7. Hertzog, N. B. (1998). The changing role of the gifted education specialist. Teaching Exceptional Children, 30(3), 39-43. McAdamis, S. (2001). Individual paths. Journal for Staff Development, 27(2), 48-50. Moon, T. R., Brighton, C. M., & Callahan, C. M. (2003). State standardized testing programs: Friend or foe of gifted education? Roeper Review, 25, 49-60. Reis, S. M., & Westberg, K. L. (1994). The impact of staff development on teachers’ ability to modify curriculum for gifted and talented students. Gifted Child Quarterly, 38, 127-135. Reis, S. M., Westberg, K. L., Kulikowich, J., Caillard, F., Hébert, T., Plucker, J., . . . Smist, J. (1993). Why not let high ability students start school in January? The curriculum compacting study (Research Monograph 93106). Storrs: University of Connecticut, The National Research Center on the Gifted and Talented. Renzulli, J. S., & Reis, S. M. (1997). Schoolwide enrichment model (2nd ed.). Mansfield Center, CT: Creative Learning Press. Robinson, G. J. (1998). Classroom practices with high achieving students: A national survey of middle school teachers. Unpublished doctoral dissertation, University of Connecticut, Storrs. Tomlinson, C. A., Callahan, C. M., Moon, T. R., Tomchin, E. M., Landrum, M., Imbeau, M., . . . & Eiss, N. (1995). Preservice teacher preparation in meeting the needs of gifted and other academically diverse students (Research Monograph 95134). Storrs: University of Connecticut, The National Research Center on the Gifted and Talented. Westberg, K. L., Archambault, F. X., Jr., & Brown, S. B. (1997). A survey of classroom practices with third and fourth grade students in the United States. Gifted Education International, 12, 29-33. Whitton, D. (1997). Regular classroom practices with gifted students in grades 3 and 4 in New South Wales, Australia. Gifted Education International, 12, 34-38.